The Christmas Social will be held at Oscars Inn on Monday 3rd December 7:30pm A selection of pizzas and sides will be served, £10 per person. If you wish to attend it is important that you email pcc@newarkcamra.org.uk with names of those wishing to attend and any special dietary requirements by Friday 30th November. We are aware of a number of people who said they wish to attend but have not confirmed via email. We look forward to seeing you. Come to the launch of the Community Share Offer. Tuesday 8 May at 7pm Elston Village Hall, Licensed bar Elston Community Pub Limited has been formed with the aim of purchasing The Chequers Pub, Elston, Nottinghamshire, for the benefit of the local community and the surrounding villages. As a Community Benefit Society we intend to safeguard the long-term future of The Chequers as a sustainable community hub, by ensuring it provides a welcome, enjoyable and accessible venue for all. Note original dates changed due to travel issues. 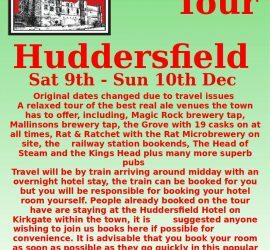 Also note that a tour of the Magic Rock Brewery has been arranged whilst we are there but any further interested parties must let Nigel know asap to ensure a place. Just Beer Micro Pub wins regional Pub Award, and there will be a presentation on the 28th October at 3.00pm. So see you there! 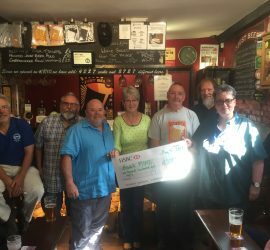 Branch chairman Andrew Birkhead along with other participants of the recent 24hr Cribbage marathon presenting a cheque for an amazing £1280 raised by the event to Newark MIND, our chosen charity for 2017.Well done guys, outstanding effort. Also a big thanks once again to Just Beer for hosting the 24hr event and the presentation.